Stabirail’s new ballastless track or slab track construction system has proven to be the most efficient method for laying railway tracks in concrete beds. Superior stability, the absence of deformation and a shallower construction height are just some of the advantages slab track, also known as ballastless track, offers compared to its traditional counterparts. 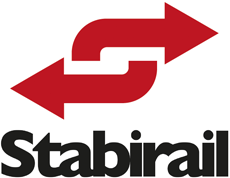 Stabirail has designed and developed a new method for ballastless track or slab track construction in tunnels and railway stations. Our ground-breaking system has proven to be the most efficient method for laying ballastless railway tracks in concrete beds. Furthermore our new slab track or ballastless track construction method guarantees higher accuracy, longer design life and lower whole-life cost.